Syncing the speaker playback - soundseeder.com | Play music simultaneously on multiple devices. 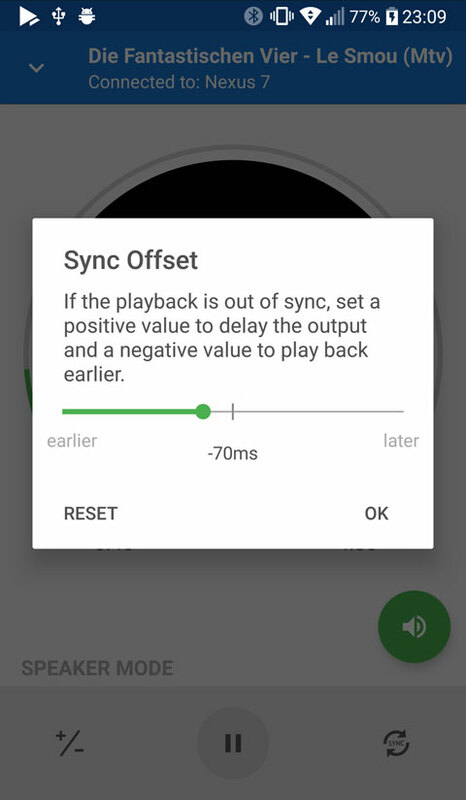 If the playback of Player and Speaker is not in sync when you run soundseeder for the first time, you can adjust the offset of your playback in steps of 10 milliseconds. In Speaker Mode press the +/- Button in the bottom-left corner to adjust the offset. The best way is, to start with offsets of -100ms and +100ms, to check in which direction you need to adjust your playback. Then adjust the playback in steps of 10 milliseconds, until its completely in sync. Once the offset is adjusted, it will be saved for further connections.